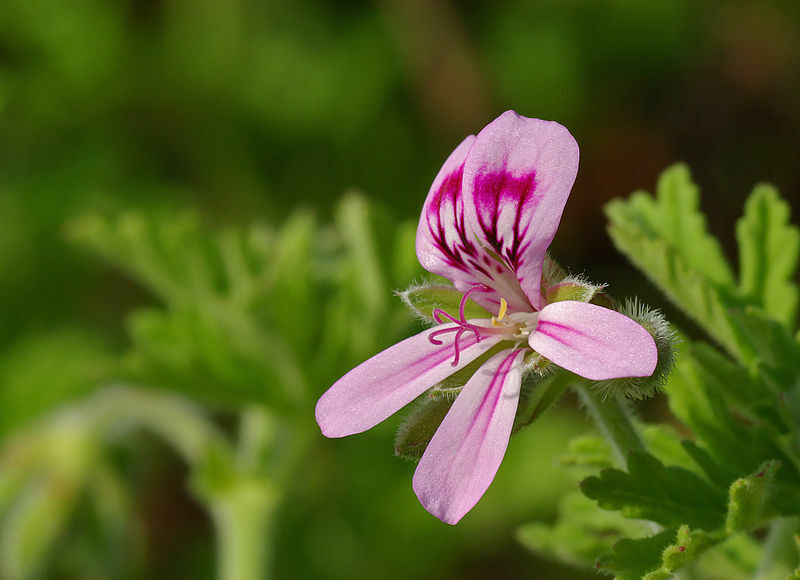 Geranium Essential oil in your medicne cabinet! Geranium and lymphatic system: It is one of the most useful essential oils for detoxifying the lymph system (along with rosemary and juniper) eliminating cellulite and fluid retention. It is a must oil for oedema of the ankles during last trimester of pregnancy (however do not use it together with rosemary and juniper during pregnancy). Just 5 drops geranium in 1 ounce of carrier oil will do the trick. Geranium and hormones: It is a must oil for any condition where a fluctuating hormones are at its worst. It is a great oil to use for PMS, for its balancing effect on hormones. It will help you with mood swings, which is pretty common during PMS, relieves pre-menstrual tension, and help with bloating. It is also a must oil for women in menopause or the ones having difficulty becoming pregnant (rose is another must for fertility). Good recipe for PMS would be geranium, rose, clary-sage, chamomile. In oune ounce of carrier oil dilute 7 dr clary-sage, rose 3dr, chamomile 4dr, geranium 7 dr, frankincense 2dr. Geranium and SKIN: Balancing action of geranium plays an important factor here. It is number one oil for balancing sebum production (other oils such as neroli, ylang-ylang, and lavender are good for that) in either oily or dry skin. For dry skin geranium goes hand in hand with rose and sandalwood, for oily skin it should be combined with bergamot, grapefruit or lemon. Geranium is excellent at keeping your pores clear and is a must oil for any ACNE prone skin. It is overall useful in many skin conditions including dry eczema, burns, shingles, even lice. It is cleansing, refreshing and may be used on for sluggish, congested and oily skin types. Geranium and pshyce: Psychologically, geranium creates a sense of security and comfort and is gently uplifting, refreshing, balancing. It is known to strengthen our subtle CHI enegy and is one of the most essential oils for anxiety, depession, melancholy, nervous debility and excessive mood swings. Great combination for that is: Bergamot and Geranium, Clary-sage and Geranium, Lavender and Geranium. Do not exceed 9 drops in total in oil warmer for a large size room. And above all it is a great insect repellent!